The Maritime and Coastguard Agency in Stornoway received dozens of calls on Friday night about a fireball falling from the sky. Lifeboat crews in the Western Isles were alerted as emergency services prepared for a large scale disaster. 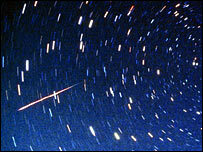 However, the cause of the fireball was linked to meteor shower Kappa Cygnid which peaked at the weekend. A coastguard spokesman said: "We received numerous 999 calls with around 40 alone on Friday night. "People were reporting seeing something like a plane going down with a tail of smoke behind it. "It would have been a shooting star from meteor activity." The spokesman added: "We discussed the situation with RAF Kinloss and other sources and concluded it was meteor activity." Kappa Cygnid is active between 15-22 August. Five meteors can be seen in an hour but it can also result in bright yellow-blue fireballs, according to the British Astronomical Association's website.